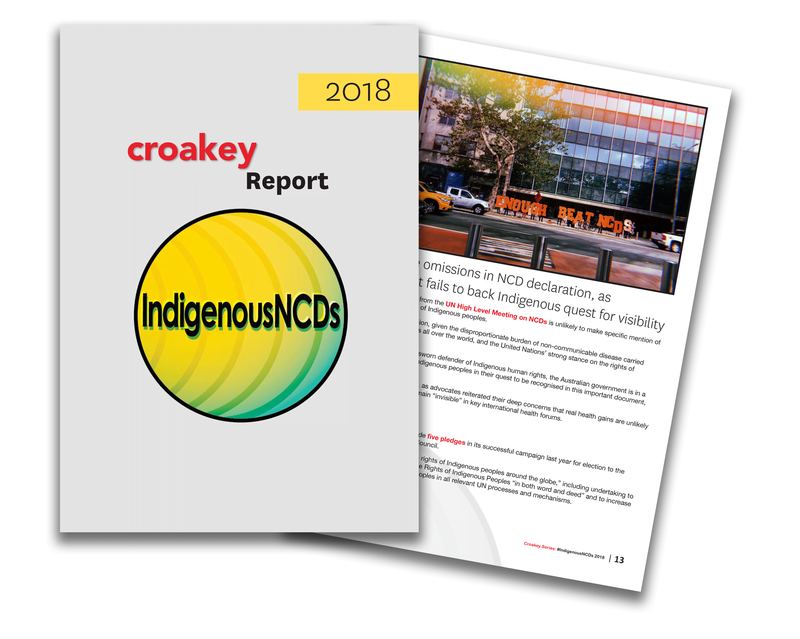 Important concerns about the potential impacts of the NDIS upon Aboriginal and Torres Strait Islander people emerged at a recent conference in NSW. 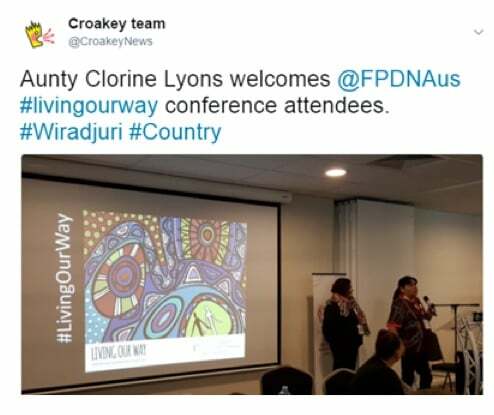 Karen Wyld provides an in-depth report below from the #LivingOurWay discussions for the Croakey Conference News Service. Hopefully her report will be closely read by the National Disability Insurance Agency and other groups. Attendees at the recent First Peoples Disability Network Australia (FPDN) conference shared a united message: nothing about us, without us. This sat comfortably alongside the official conference theme – Living Our Way. 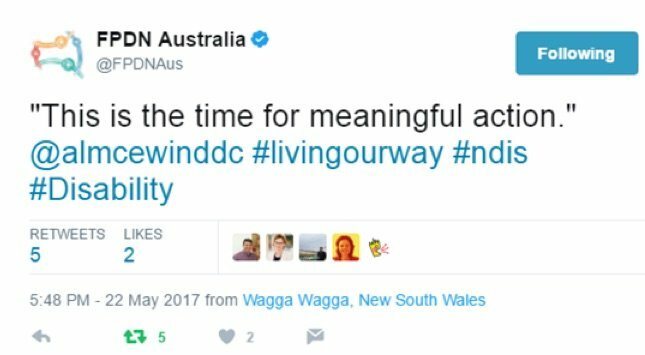 The Living Our Way conference was held in Wagga Wagga, on Wiradjuri country, between 23 and 25 May 2017. It was attended by Aboriginal and/or Torres Strait Islander people with lived experience of disability, carers, people working in the disability sector, and other interested persons. The conference was sponsored by the Australian Centre for Disability Law. With FPDN hosting, and a predominantly First Peoples audience of attendees and guest speakers, the message of nothing about us, without us was strongly embraced throughout the three days. Other messages emerged throughout the conference, all contributing to an understanding of what it means to be Living Our Way for First Peoples living with a disability. Not surprisingly, the National Disability Insurance Scheme (NDIS) was a much-discussed topic. Using our way (i.e. by and for First People living with disability) no one gets left behind. A combination of evidence-based and knowledge-based (culture, community, lived experience) is a stronger approach. The benefits of using a social model of disability. 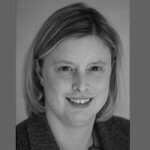 Positioning disability as a stand-alone Closing the Gap target. 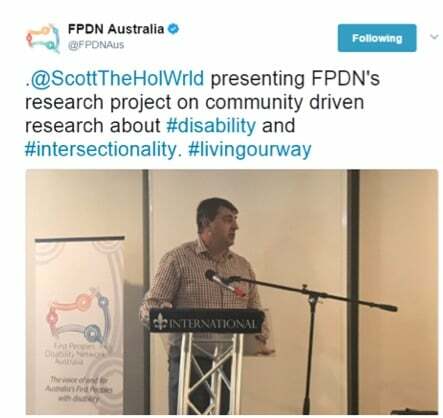 Intersectionality of First Peoples living with disability. Government, National Disability Insurance Agency (NDIA) and mainstream disability services need to engage more; to listen and respect First Peoples living with disability and peak bodies/advocates. Resources need to be given directly to Aboriginal and Torres Strait Islander controlled services/peak bodies. Potential opportunities through NDIS – such as employment, increased services and consumer-control. Concerns about NDIS – including eligibility, unclear processes, poor communication, and capacity to deliver locally-relevant culturally-appropriate services. Expected barriers of accessing NDIS for people living in rural/remote communities – such as lack of equitable access and limited choice. On the morning of Tuesday 23 May, attendees and guest speakers were welcomed by Aunty Clorine Lyons. June Riemer, Deputy CEO FPDN, then opened the conference. First speaker was Damian Griffis, CEO FPDN. To acknowledge the 20th anniversary of the Bringing Them Home Report, Griffis led a minute’s silence for the many people affected by the forced removal of children. For more information on #BTH20, see the Healing Foundation’s Bringing Them Home – heal our past, build our future. Damian Griffis, a Worimi man with decades of experience working within the disability sector, set the scene for the next three days. He spoke of how First Peoples have always been inclusive and caring of family and community. As is often said, there is no word in First Nations’ languages for disability. Griffis also referred to archaeological evidence that backs up First Peoples’ oral histories of communities caring for people who have a disability. He stressed that disability is not a health issue, which is why FPDN uses a social model of disability. Griffis spoke of the barriers and social determinants that can impact on Aboriginal and/or Torres Strait Islander people who are living with disability. 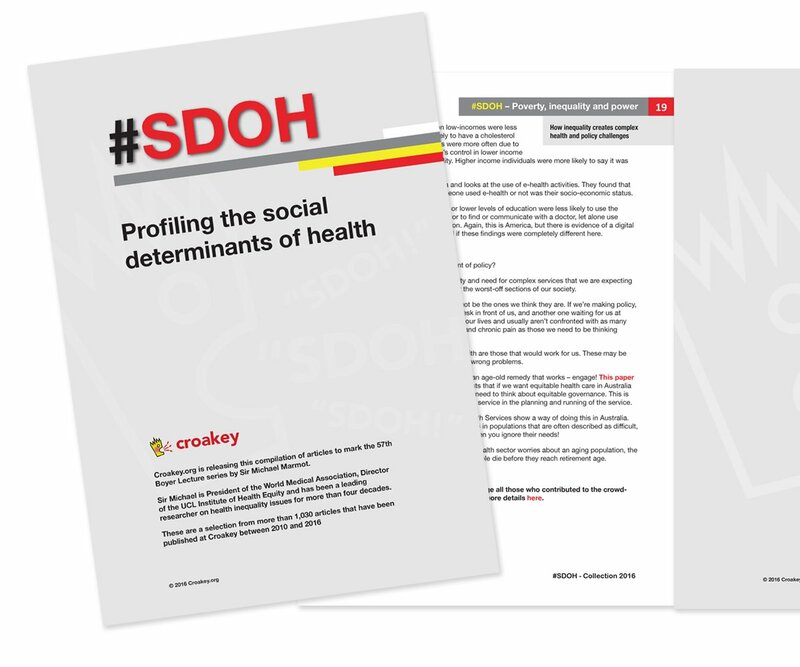 Clear links between social determinants (i.e. poverty and nutrition, access to housing) and historical drivers (i.e. 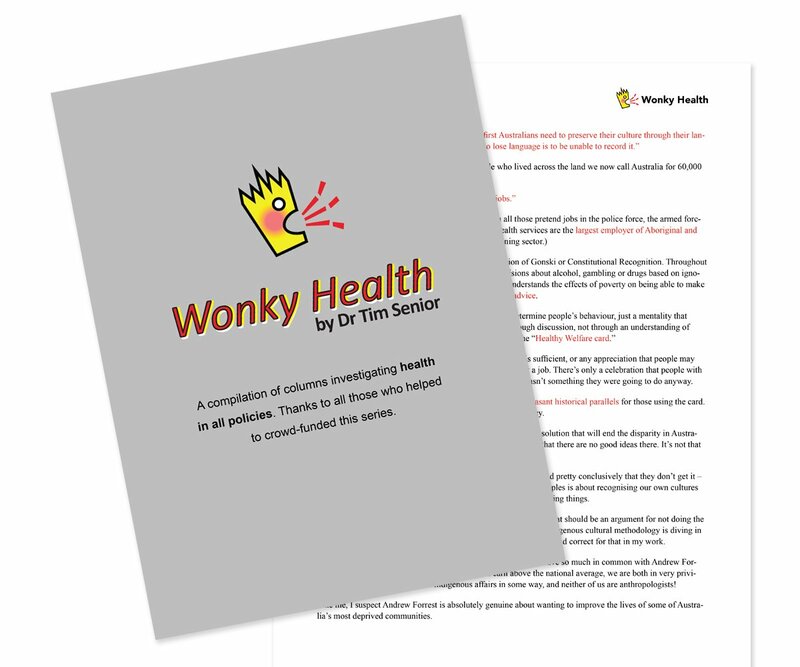 colonisation, key policy eras, institutional racism) can often be explaining factors for the high prevalence of disability amongst First Peoples in Australia. Griffis also proposed solutions, such as the urgency for disability to be a stand-alone target in the Council of Australian Governments’ (COAG) Closing the Gap strategy. The way in which resources are allocated also needs addressing. There is ample evidence that positive outcomes occur when First Peoples are resourced to lead and deliver their own initiatives. With an estimated nine percent of NDIS consumers being Aboriginal and/or Torres Strait Islander people, there is no better time than now to discuss resources, services and opportunities. Potentially, the NDIS could result in more services and resources, and a growth in Aboriginal and Torres Strait Islander employment. Griffis highlighted two areas of employment disparities that need to be addressed: people living with disability, and carers. Friends and family members often go beyond the role of carers; providing a level of care similar to service providers but in an unpaid capacity. Such carers need to be better supported, and paid as disability workers. Providing opportunities for Aboriginal and/or Torres Strait Islander people living with disability to secure accessible and stable employment is also essential. To better position the First Peoples disability sector, FPDN will be launching a 10-point plan later this year, putting forward a strong position on why First Peoples need to lead and control their own markets (i.e. disability services, resources and workforce). The next speaker on day one was Alastair McEwin, Disability Discrimination Commissioner, Australian Human Rights Commission. McEwin commenced this role in July 2016, bringing with him extensive experience in law, education, arts, and disability. 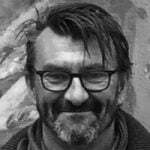 He has an impressive array of past roles, including coordinator of the World Federation of the Deaf Expert Group on Human Rights, CEO of People with Disability Australia, and Manager of the Australian Centre for Disability Law. McEwin’s respectful approach, and understanding of the disabilty sector as a person with lived experience, was evident throughout his speech. And he made a few strong calls for action. Taking every opportunity possible to advocate and steer change is a part of McEwin’s strategy. For example, he says that he will often ask members of Parliament how many people with disability their departments employ. By doing this he is able to challenge them to think, and then possibly re-think their preceptions, which can lead to change. 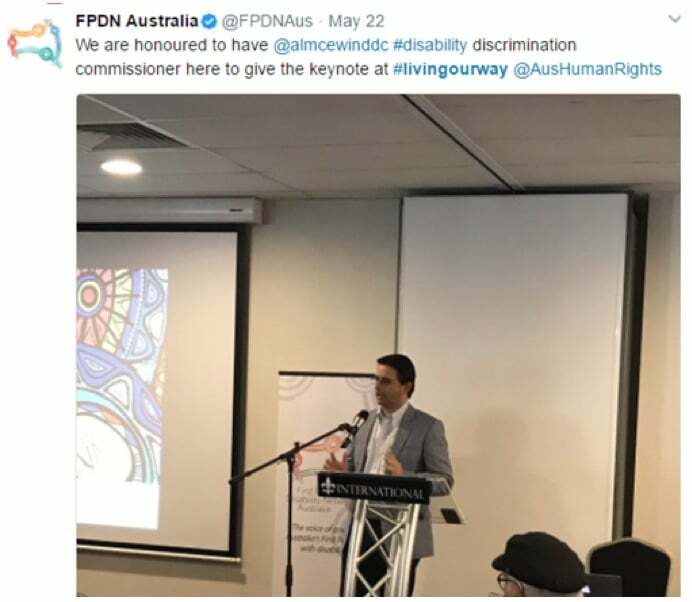 McEwin has a few goals in his position as Disability Discrimination Commissioner, such as working collaboratively with June Oscar, Aboriginal and Torres Strait Islander Social Justice Commissioner, Australian Human Rights Commission. Oscar only commenced in April 2017, so they have not yet had time to sit down to talk. In a short interview later that day, McEwin elaborated further on some of the points raised in his keynote speech. He was joined by Scott Avery, FPDN Policy and Research Director, who asked several questions that elicited poignant responses from the Disability Discrimination Officer. The conference program was well-constructed, with all presenters offering a lot of information, useful tips, and positivity. The keynote speech was followed by Tania McInnes, Director of Hard to Reach, NDIA Scheme Practice Branch (Northern Territory), who explained the approach that her team has taken in developing NDIS resources and rolling out the program in NT. She went into depth to show their 3-tier Engagement Strategy, which is inclusive of community and family. McInnes, an Aboriginal woman in a leadership role, proudly talked about the high Aboriginal and Torres Strait Islander employment rate within their branch. In this session, there was considerable comments from the floor in regards to NDIS and First Peoples. Many people had concerns about people being overlooked during the roll out stage, and choice of services not being adequate in rural/remote regions. Next up was Paul Calcott, National Operations Manager, FPDN. A Wiradjuri man with lived experience of a disability, he uses art in many of his projects, including in the development of the Proper Way planning book, which is supported by an interactive resource booklet and film. These resources will be launched later this year, in time to support First Peoples to prepare for the NDIS. Using a narrative approach, Proper Way will assist people to identify what supports they will need to live their way, and to plan their ideal NDIS package. 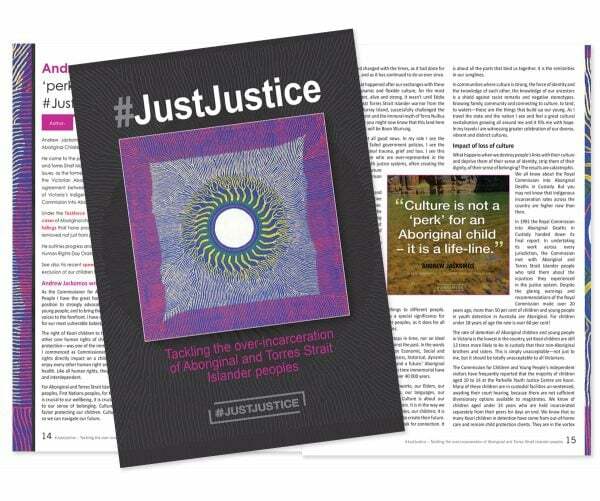 It is hoped that culturally-appropriate and easy-to-use resources such as Proper Way will enable more Aboriginal and Torres Strait Islander people to receive services that best fit their aspirations and needs. It was good to see local media cover the conference. 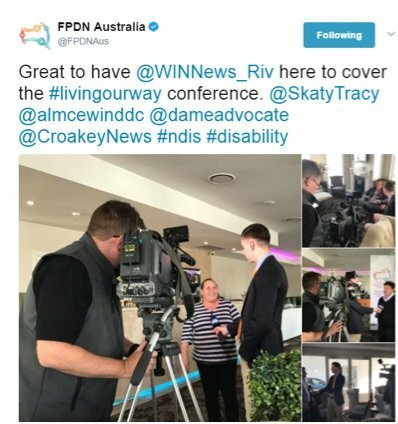 WIN News Riverland interviewed FPDN employees, guest speakers and attendees, to use on their televised news program later that day. In the afternoon, attendees split into three groups to attend Breakout Sessions. Targeted resources were the key theme of Annamarie Reyes’ session. Reyes works with My Choice Matters, who have developed a range of resources for multicultural communities. 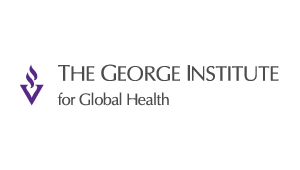 They intend to develop specific resources for Aboriginal and Torres Strait Islander peoples. As in previous sessions, concerns about NDIS were raised, such as: equitable choice of services, appropriate resources for First Peoples need to be developed by First Peoples, and accessibility of information. There were concerns about the NDIS’s lean towards online, which could create accessibility issues for Aboriginal and Torres Strait Islander peoples who have no/limited access to phones and computers. Added to inadequate internet access in remote regions, this will be a huge barrier for many. Christine Regan, New South Wales Ombudsman, ran through some of the training packages and videos that her team uses in upskilling people to know their rights. She used elements of the disability rights training programs, so this session was very interactive. The last session of the day was outstanding. 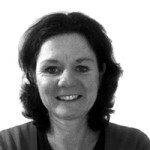 Dianne Brooks, NSW Manager, FPDN, used real life scenarios to unpack the NDIS principles. 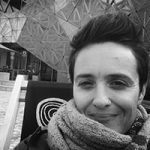 Brooks, a Yorta Yorta woman with extensive experience as both a carer and professional in the disability sector, talked about how good planning will enable people to get the most out of NDIS. She was joined by a work colleague, via Skype. Tanya Lewis, FPDN, spoke to the group from her bed. Due to lack of adequate services, Lewis had been confined to a nursing home after a stroke when she was younger. Lewis was the first Aboriginal person to receive a NDIS package, which enabled her to leave a nursing home and back to family. Lewis had a strong message to share – just give it (NDIS) a go. And state what you need from the scheme, learn how NDIS works, and make it work for you. This session was one of the standouts from the conference, with a very positive message to end the day on. Scott Avery, Policy and Research Director, FPDN, was the first speaker on day two. A Worimi man and doctoral candidate with an ability for making stats and facts tell strong stories, Avery quickly had everyone’s attention. As with Damian Griffis’s session the previous day, Avery talked about why FPDN uses a social model of disability. Avery explained the co-design research model that he uses in his work. He also talked about his recent intersectionality research, and how it relates to Aboriginal and Torres Strait Islander people living with a disability. Using an evidence-based approach, Avery has been able to better advocate, as well as map emerging trends. He sees research as another avenue where First Peoples living with a disability can be heard. His approaches are honest, and people-led. Avery read out a few alarming stats. For example: 45 percent of Aboriginal and Torres Strait Islander people have some form of disability. 7.7 percent have a severe and profound disability (34,000 people). This is 2.1 times higher than other Australians (using an aged adjusted ratio). However, the Australian Government does not have any stand-alone First Peoples disability departments or strategies, and lacks culturally competent models of funding and service provision. Next up was a late addition to the program. Regan Jewsen, NSW Department of Industry, and Harriet Jobson, NSW Department of Aboriginal Affairs, spoke of a new, collaborative program. Disability Sector Scale Up is an innovative approach by the NSW Government, to help business and community become NDIS-ready. This collaboration, with an allocated $4.5 million, will support employment and start-ups in the disability sector. Once again, attendees raised concerns about having access to culturally-appropriate services, especially in rural/remote regions, and the potential loss of grass-roots services that communities currently have good relationships with. Regan Jewsen, a Sydney-based Aboriginal woman working in government, acknowledged that she does not have all the solutions, but trusts that each community will. 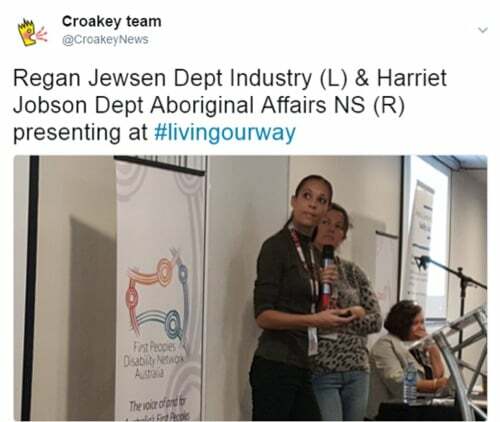 Both Jewsen and Jobson were supportive of seeing Aboriginal and Torres Strait Islander community-led initiatives, and encouraged people to talk to them. 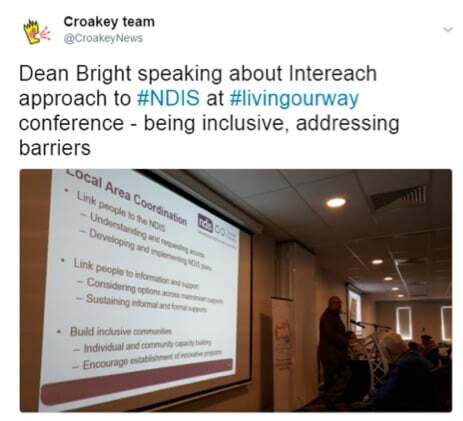 Non-NSW attendees expressed hope that other states and territories will implement similar programs, and funding, to help people transition to services under the NDIS. Next session was presented by Dean Bright, Senior Manager Murrumbidgee, Intereach Planning. Social Futures, a NSW NDIS partner, has sub-contracted Intereach. Bright spoke of Intereach’s approach, to enable them to reach the 4,000 people eligible for NDIS in their service-region. Basically, if people don’t speak with Intereach, then they won’t get an NDIS package. To be able to reach people, and support them to get the right NDIS services for their needs, Intereach knows they need to build the right team. They are currently recruiting, and hope to attract Aboriginal and Torres Strait Islander employees. 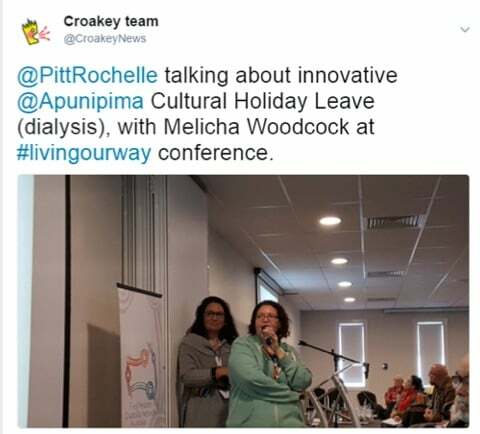 Next up was Rochelle Pitt and Melicha Woodcock, presenting on the far-north QLD Cultural Holiday Leave for Aboriginal and Torres Strait Islander people on dialysis. Rochelle Pitt, a Wirri/Butcehlla/Kalkaddon woman, is a renal nurse at Apunipima Cape York Health Council, and Kidney Health Australia Ambassador. Melicha Woodcock, a Yungabarra/South Sea Islander descendent, is a carer and disability advocate from Cairns. She is currently working with Synapse’s QLD NDIS Participant Readiness Project. They talked about the many barriers that Aboriginal and Torres Strait Islander people on dialysis have if they need to attend community/cultural activities, including Sorry Business, going back to Country, or visiting family. To highlight some of these barriers, and to explain the initiative they’ve implemented, they used a case study. Uncle Willy Kabay had not been home for 13 years, having moved to access regular dialysis treatment. Uncle Willy joined in the discussion via Skype. This story had a happy ending, with Woodcock opening her home for Uncle Willy, after a massive team effort to get him to Cairns for two-weeks of Cultural Holiday Leave. And Uncle Willy is now planning his next trip, which he’ll squeeze in between his volunteering at a local men’s group. Pitt then spoke about new technology that could potentially enable more Aboriginal and Torres Strait Islander people to go home to country, community and family. Or to access dialysis from their homes, instead of frequent trips to hospitals. The video she showed, of very slim-line, easy-to-used dialysis machines, was inspiring. If funded, this new technology will be a lifesaver for many First Peoples. Last session for day two was Tom Powell, Wiradjuri man, from Red Dust Healing. He developed this program to support social emotional healing for Aboriginal and Torres Strait Islander people. It’s had a big impact on supporting men and boys. Powell took attendees through the reasoning behind the program, and demonstrated the key activities. A video presentation showed some more benefits of the program, as well as testimonials from past participants. After an enjoyable conference dinner, with entertainment by Col Hardy and his band, the first session on the final day was Suzanne Donnelly from Positive Partnerships, speaking about their work with Autism Spectrum Australia. Positive Partnerships is a national project, funded by the Australian Government, that works with schools to support children with autism and their families. They have a broad range of resources and online supports, DVDs, online courses, interactive tools, and fact sheets. Also available are resources developed specifically for Aboriginal and Torres Strait Islander families. Emma Bedwin and Jenny Beath, Community Engagement Coordinators, Department of Fair Trading NSW, then covered the NDIS and people’s rights. 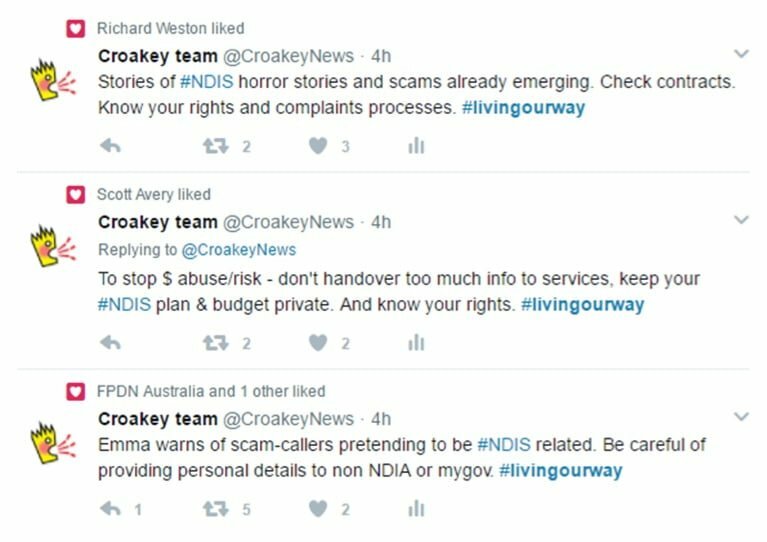 Bedwin outlined the ‘business’ side of setting up NDIS contracts, including the complaints process. With approximately 400 accounts of consumers’ issues during the NDIS rollout, it’s important that people know their rights. Protecting personal information is essential, including not allowing service providers access to log on details. Being safe online and over the phone was a key message, as there have already been instances of scam-callers. Becoming more aware of NDIS processes, consumer rights, complaints processes, and where to get support, will enable people to get the services they need. This was a very informative session, with a few cautionary tales and strong messages on how to be safe and empowered during the transitioning to NDIS. 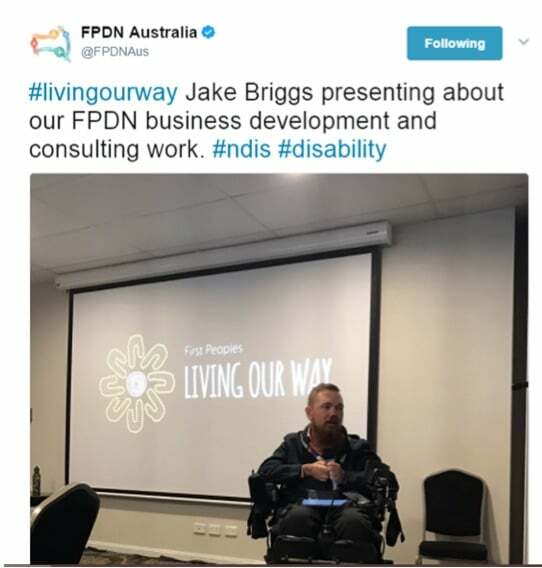 Jake Briggs, FPDN, talked about NDIS Coordination Workforce. Briggs, a Kamillaroi/Wonnarua man with professional and lived experience of disability, explained how he viewed the conference theme of Living Our Way. And reminded everyone of FPDN’s strength of being by and for First Peoples living with disability. Briggs provided some excellent tips on getting the most from NDIS and service providers. And stressed that individuals are now in control, with the ability to choose what supports they need and what services to engage. As mentioned in previous sessions, Briggs sees ways that the NDIS can potentially strengthen the Aboriginal and Torres Strait Islander disability sector and workforce. Briggs also spoke briefly about innovative designs in purpose-built housing, before being joined on stage for the final session. 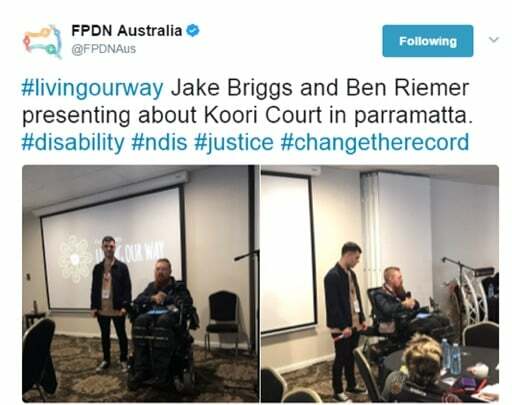 Ben Riemer, FPDN, joined Jake Briggs to talk about their work with Koori Courts. 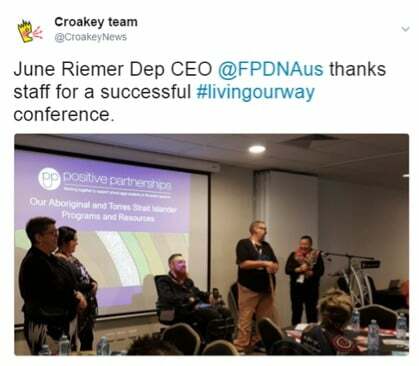 Approached by judges who saw a need for better support of Aboriginal and Torres Strait Islander people with disability presenting to Court, FPDN stepped in. 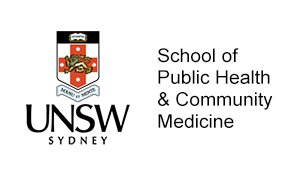 The program currently operates in Parramatta, but needs to be expanded. This work is not funded, which is a barrier to expansion. Briggs estimates that 2 out of 5 young Aboriginal and/or Torres Strait Islander people going to Koori Court have a disability. Mostly intellectual or cognitive, and lacking support services. Briggs and Riemer can link people to supports, to stop them falling deeper between the cracks. This program is built on strong engagement principles, with Briggs and Riemer working with Elders, young people and community. As the last session wrapped up, June Riemer, Deputy CEO, spoke highly of this engagement work. She also recognised the need to mentor and build the future leaders within the First Peoples disability sector. The last session transitioned into a conference wrap-up. June Riemer asked FPDN staff to come forward, as she thanked them for their contributions in ensuring the conference was a success. June thanked the conference sponsors, Australian Centre for Disability Law, who have been supportive of FPDN in many ways. Uncle Lester Bostock was acknowledged for his decades of leadership, research and advocacy in the First Peoples disability sector. 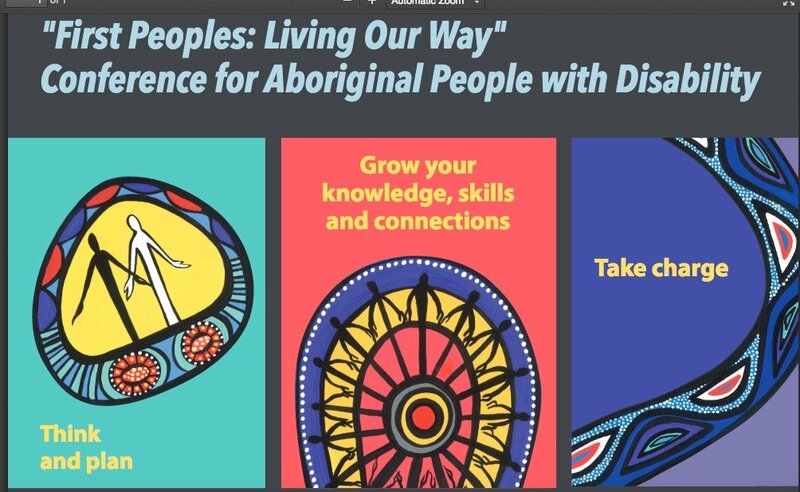 The First Peoples Disability Network’s Living Our Way conference ended on a positive note, with attendees looking back on past achievements, while being prepared to move forward together. The message throughout the Conference, and beyond, is powerful: nothing about us, without us. 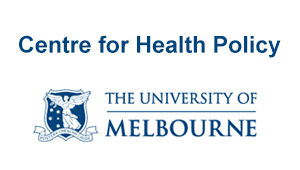 The Living Our Way conference was kindly sponsored by the Australian Centre for Disability Law. 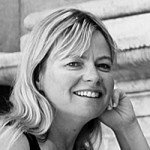 Download 21-pages of LivingOurWayTweets, compiled by Karen Wyld. 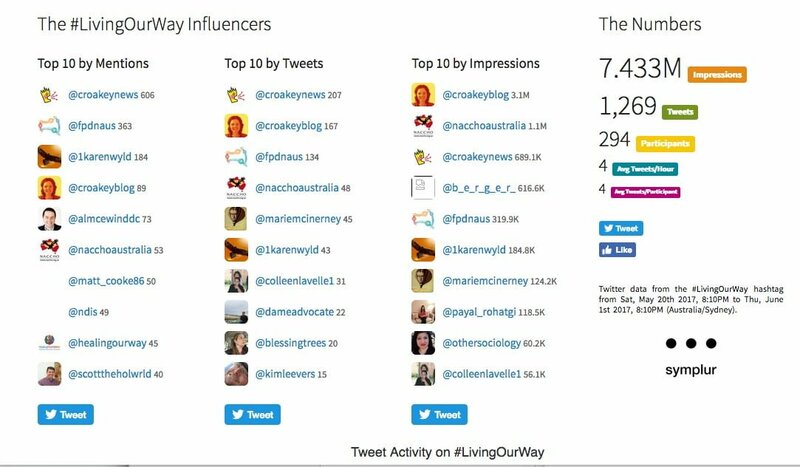 Warm thanks to all who helped to share the #LivingOurWay news. Read the full Twitter transcript at Symplur. This is very heart warming. Discussing the needs of the less fortunate. We must always strive to be an inclusive society and this gives me hope. 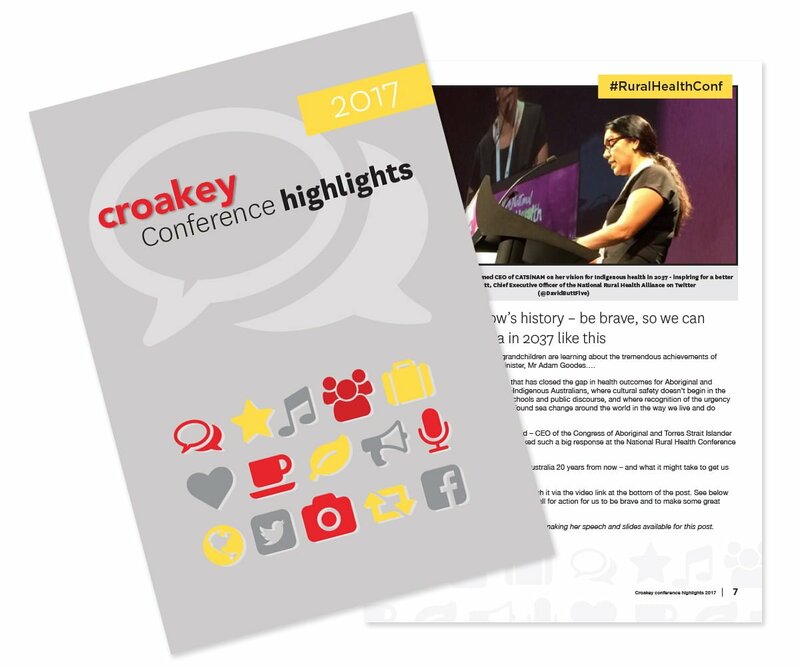 Great work Karen and the Croakey mob!